Ambaji temple is situated at Ambaji town, in the Banaskantha district of Gujarat. The temple, the holy the seat of Ambe Mata - the Mother Goddess, is a popular pilgrim place for Hindus. People of Gujarat take the name of the Goddess in high regard. Ambaji temple is also considered as one of the Shakti Peethas in India. The Goddess is a manifestation of Shiva's consort, Parvati. Ambe Mata is the Adya Shakti- the primordial female power, the Mother Goddess. 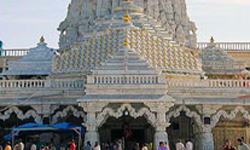 The Navratri celebrations are organized on a large scale in the Ambaji temple. During the festival, a huge fair is organized here every year. People celebrate the occasion with great pomp and show. They sing and dance in praise of the glory of the Goddess. The temple is located on the Arasur hill in the Aravalli Range. The most fascinating feature of the shrine is that it does not contain any idol. It only has a yantra, made of marble which is engraved at a spot. A large number of devotees throng the Ambaji Temple during Purnima fairs held, on the full moon day, in the months of Kartik, Chaitra and Bhadrapad. A short distance from Ambaji, there is a hill named Gabbar Hill. People believe that the Goddess revealed herself on the hill and left the imprints of Her feet. She is even considered the prime Goddess of the region. This has made the place a pilgrim for the Hindus in the state and outside.